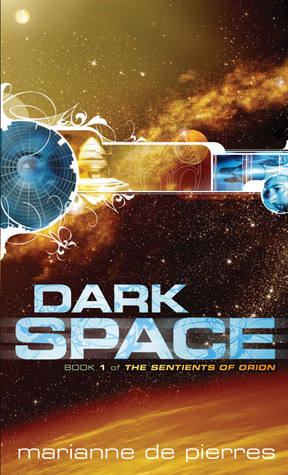 Dark Space is the first of the Sentients of Orion series by Marianne de Pierres. The storyline primarily follows three characters – Baronessa Mira Fedor, a member of the planet Araldis’ aristocracy and born with a genetic makeup that allows her to interact directly with living spaceships, Trinder Pellegrini the spoiled son of Araldis’ planetary ruler and Tekton, an influential citizen of the planet Lostol chosen as a candidate to interact with a recently discovered powerful entity some think is God. These three point of view characters are interesting selections. All of them are from positions of great wealth and privilege. None of them is particularly sympathetic (although for entirely different reasons). I think the reader is meant to side with Mira, but I found it hard to warm to her. With three unsympathetic main characters you’d think the story would be in trouble, but the way the storylines interact really works. You see glimpses of the potential for growth in Mira and Trinder, and Tekton is so self centred and devious I found myself cheering for him. So while the characters were not sympathetic, I found them compelling. Just as good in my books. The world building behind the story was comprehensive and consistent. There is plenty of ground setting in this first book for the rest of the series to build on. The cultures of the various planets and societies referenced, the implications of “humanesque” vs alien sentients and the technology were all well thought through and supported the story. Italian is not the first culture you expect to see represented in a space opera. This created an interesting point of difference from a lot of other books. The repressed role of women on Araldis provided the source of a lot of the conflict in the novel. It was interesting to think about how some cultural traits that we consider backwards could flourish if the cohort who supports them were to get their own planet. The plot was enjoyable, with plenty of political intrigue and short bursts of action. Interesting questions were raised and story arcs begun. I’ll certainly be tracking down the rest of the books in the series to see how the story unfolds. I still might not have the settings quite right on IntenseDebate – let me know via email if anything else gets swallowed! Yes, I installed it as a part of my attempts to reduce spam. It's getting ridiculous. Last month I nearly used up my entire website bandwidth limit, and believe me I don't have that many visitors. It's all spam comments and attempts to crack my admin account! In the last few days I've installed IntenseDebate, Bad Behavior and spent <insert deity of choice> knows how many hours trying to tweak security settings! I have all of the series but because I bought it for personal reading it has languished in my TBR pile.